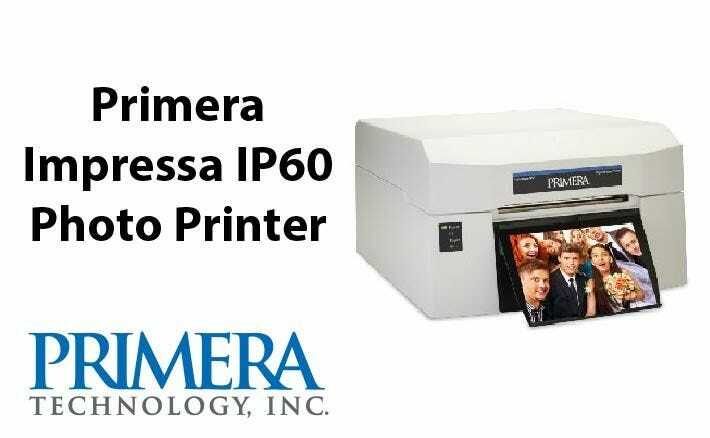 Impressa IP60 Photo Printer | Photo Printers | Primera Technology, Inc.
Widest Range of Substrates: gloss, matte, luster, magnetic, postcard, repositionable adhesive, you name it! How do I print from my Photo Booth Software? 1. How much does IP60 cost? MSRP is $899.99, and MAP (your price) is $799.99. 2. How long does it take to print photos? 3.5 seconds for a 2x6, 7 seconds for a 4x6, and 14 seconds for a 6x8. 3. How much does the printer weigh without photo paper installed? Only 8 lbs. (3.6 kg). 4. What is the print resolution? 1200 x 1200 dpi, up to 1200 x 4800 dpi. 5. What are the various print sizes? 2x6, 4x6, 6x6, 6x8, 6x9, 6x12, 6x18, 6x24—any 6” wide image up to 24” long. 6. 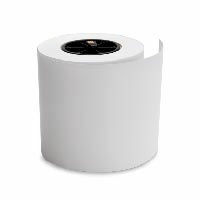 What types of photo paper can I purchase for use in IP60? 7. 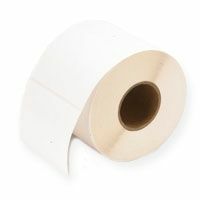 How many prints can I get on one roll of media? It depends on the media. The 8 mil glossy and luster rolls can get about 500 4x6 prints. The repositionable luster is thicker and yields 285 4x6 prints. 8. How many prints can I get from one ink cartridge? About 500 4x6 photos, but it depends on the photo. Lighter photos use less ink and vice versa. Some 4x6 images can be printed as many as 1,000 times in one cartridge! 9. How much will my prints cost? As mentioned above, costs are contingent on the ink used in each photo. We’ve determined the average costs per print are $0.06 for a 2x6, $0.12 for a 4x6, $0.24 for a 6x8. 10. 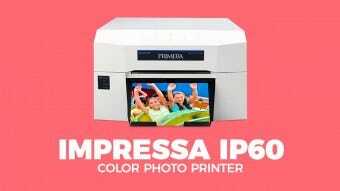 Why should I buy an Impressa IP60 over a dye-sublimation photo printer? Most versatile – print 2x6, 4x6, 6x8, 6x12, 6x18, even 6x24 without having to change media. Dye-sublimation printers need to change the ribbon for every size since the individual CMY panels have to be the same size as the print. IP60 is inkjet and doesn’t require ribbons. 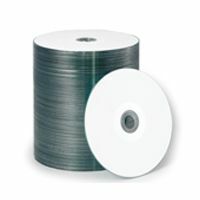 Widest range of media – print with glossy, luster, and repositionable adhesive backing, etc. Dye-subs are limited to glossy and a low-quality “matte” finish. 11. What is the maintenance kit? 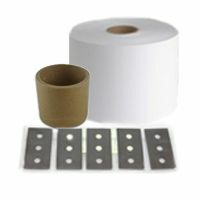 The Ink Filter Maintenance Kit (SKU 057342) consists of one ink tray felt, two air pre-filters, and three air filters. Based on standard usage, we recommend users replace their filters every six months. Primera PrintHub will also issue a reminder every six months. Replacing IP60’s filters will help ensure the printer is operating efficiently and producing the highest quality output. Specific questions can be directed to Primera’s Technical Support team. 12. Is there a wireless printing option for the IP60? Currently there is not a built-in wireless printing option for the IP60, however in the near future we will be offering an add-on wireless module to plug into the printer that will offer printing wirelessly from Apple devices. 13. Can you print photos directly from your DSLR camera? The IP60 does not allow printing directly from a DSLR camera through Wi-Fi or direct USB connection. This includes protocols like PictBridge enabled cameras. However, there are a few options and workarounds for shooting and automatically printing. Please visit our knowledgebase article for further details. 14. What photo booth software works with the IP60? The IP60 works with most of the major photo booth software brands. 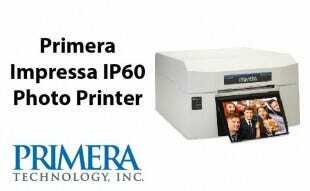 The Impressa IP60 Photo Printer works with most of the major photo booth software brands. Impressa IP60 Digital Photo Printer includes a built-in pizza-style cutter, Primera SNAP™ Photo Software, printer driver for Windows 7/8/10+, and quick start guide. Requires an available USB 2.0 port. IP60 is compatible with many popular Photo Booth Softwares. 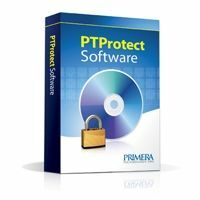 Use the guides below for your specific software. Please contact Technical Support if you have any problems. 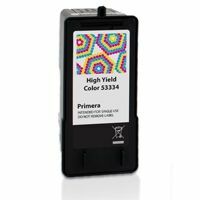 NOTE: This single, full-color ink cartridge provides the most vibrant and brilliant colors for any application.